N-heterocyclic carbenes (NHCs) have found increasing use as reagents for a range of organic transformations and in asymmetric organocatalysis. The performance of these molecules can be improved and tuned by functionalisation. Functionalised carbenes can anchor free carbenes to the metal site, introduce hemilability, provide a means to immobilise transition metal carbene catalysts, introduce chirality, provide a chelate ligand or bridge two metal centres. NHC can be attached to carbohydrates and campher, derived from amino acids and purines, they can be used as organocatalysts mimicking vitamin B1 or as weak “solvent” donors in lanthanide chemistry. Functionalised N-Heterocyclic Carbene Complexes describes major trends in functionalised NHC ligands, aiming to assist readers in their attempts to develop and apply their own functionalised carbenes. 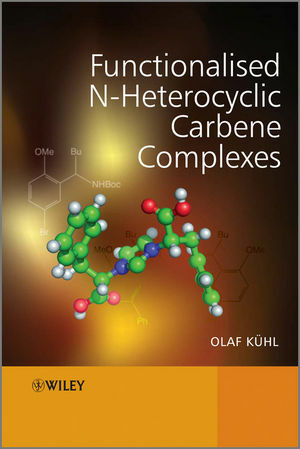 After an introduction to the chemistry and behaviour of NHC, the book gives a detailed description of functionalised carbenes and their complexes according to a range of functional groups, each with a discussion of the synthetic route, structure, stability and performance. Functionalised N-Heterocyclic Carbene Complexes is an essential guide to fine-tuning this important class of compounds for practitioners, researchers and advanced students working in synthetic organometallic and organic chemistry and catalysis. Olaf Kühl was recently habilitated at Greifswald University. His main research interests are in organometallic and coordination chemistry with an emphasis on ligand design, particularly in the areas of N-heterocylic germylenes, carbenes and phosphino ureas. Chapter 1 The Nature of N-Heterocyclic Carbenes. Chapter 3 N-Heterocyclic with Neutral Tethers. Chapter 4 N-Heterocyclic with Anionic Functional Groups. 4.3 NHC Ligands Incorporating Cp Moieties. 4.4 Transition Metal NHC Complexes Involved in the Activation of C-H Bonds. 4.5 Immobilisation of the Catalyst. Chapter 5 Chiral N-Heterocyclic Carbenes.